How Do Document Scanning Services Help You? When we think of ways to streamline the way we operate and to cut costs, they never really think of scanning as a way to do it. For some reason, more often than not, one of the first things to think about is reducing staff or reorganising the way that staff do their day to day work. There’s nothing wrong with that, but we like to think there’s a better way that will not only improve the way you and your team work on a day to day basis but also improve things significantly in other areas too. Relying on outsourced scanning services is an interesting and cost effective way to do these things. I mentioned above that this is something that never really comes instantly to some decision-maker’s minds, but that’s changing in a big way on an almost daily basis. As little as 5 years ago, document scanning services were seen as something of a luxury, a way to modernise a business in order to show how forward thinking they were with no real necessity. These days, with cuts everywhere and businesses squeezing every penny they can to retain and hopefully boost profits, document scanning has come much more into the light as something that can be truly helpful to businesses. After all, it meets the criteria; it improves efficiency, it makes a company more progressive and forward thinking and, ultimately, it costs very little. Scanning service companies are now in a position where they can afford to pass on some serious savings because of the quality of document scanning equipment these days. A lot of the more industrial scanners can scan documents in excess of 160 pages per minute and, as for the software which can make those documents fully readable to a computer system and therefore searchable, it’s as close to perfect as it will ever get. Having your document scanned and converted to digital files has many advantages and this is where the service truly shines. You can boost efficiency significantly because documents become considerably easier to search for and find because of that advanced OCR software. This means that rather than looking through filing cabinets for documents which may have been misplaced or lost, you can simply search for reference numbers, customer names etc. and all the relevant documents will pop up right in front of you. This saves countless man hours. On top of this, if you have a lot of documents taking up space, this can be significantly reduced if you decide to have your files securely shredded afterwards. It’s been known that people have 50 filing cabinets taking up office space which have been reduced to only a few or even none at all because of all of the other documents being digitised and recycled thereafter. This extra space can be used in many different ways including installing new, necessary office equipment, or just giving your team some much needed space which can make a massive difference to morale. Beyond this there are many other advantages such as saving extra money from not using document storage and much more. A lot of the advantages of document scanning services can come on a much more personal basis depending on the company. 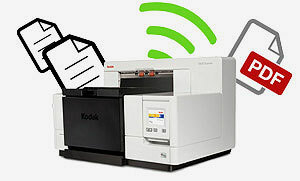 If you’ve had document scanning performed before and want to share your experiences, please leave a comment. If you have been persuaded by how document scanning services can help you, get in touch today.